It was one of those mornings where you just knew you had to go wheeling. So Dave (97 TJ), Jeb (97 TJ) Cole (77 CJ-5) and us (73 CJ-5) headed to a trail called Baldie Mountain. Which is located in the Mat-Su Valley, just out side the small town of Wasilla, Ak. All week it had been raining very hard, along with some lighting. So we knew that the trail would be wet and nasty. 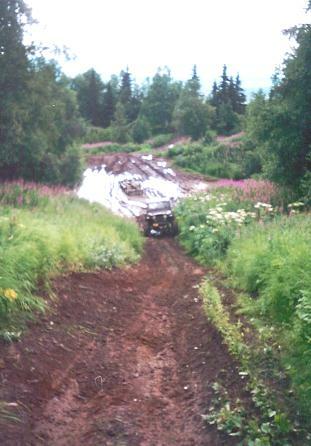 The First obstacle was a Hill we call the S Hill, or also known as Cable Hill. We thought the hill would prohibit a challenge to all vehicles, but did not. Jeb was the first to go up, and walked right up it, hardly spinning a tire. Dave was next and did the same with his MT/R�s. Cole and us made it up with no problems as well. From there the trail was a walk in the park. 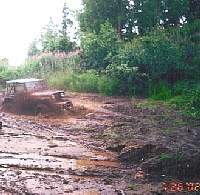 It had not rained enough to make the trail wet, and nasty. 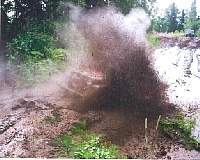 The second hard obsticle was the Mud Pit. Easly one of the muddiest, nastiest mud pits on the trails we run up here. 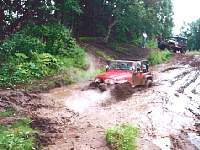 We got to the top, to find Dave right in the middle of the mud pit, buried to his rock panels. On the other side of the mud pit, was a nice 2ft straight up bank. 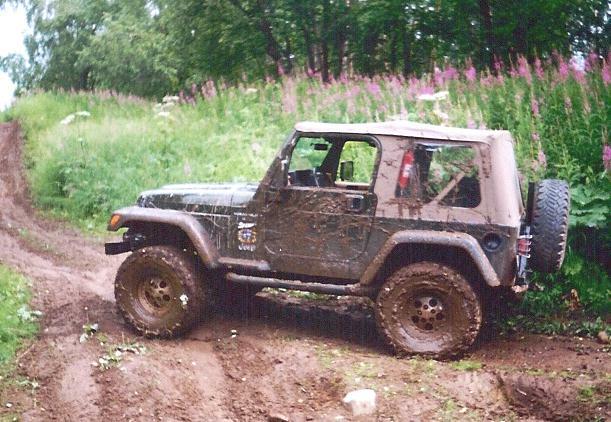 That was just slick mud. 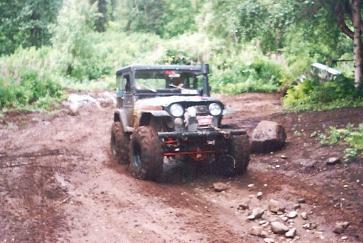 Dave was able to winch out of the mud hole, and get started up the hill, that was right after the pit. So next was Jeb. 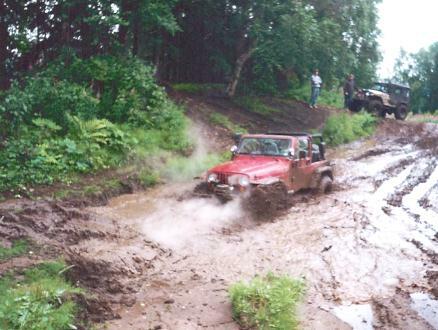 Who came into the mud pit at full throttle, Jeb got about half way across, same as Dave and decided to pull cable. Dave, and Jeb decided to head on up the trail. There Dave could not get started on the hill that was in front of him. So Jeb, went around Dave, drove to the top of the hill, and winched him up. So now it was are turn, we knew that it was very un-likely that we would get all the way threw and come up the other side of the bank. So we let the 302, and the boggers SCREAM! 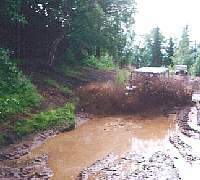 We went across the pit, but right when we hit the bank on the other side, there was no chance that we were going up it. The front 60 had dug straight into the bank. So we pulled the cable and winched up the bank. 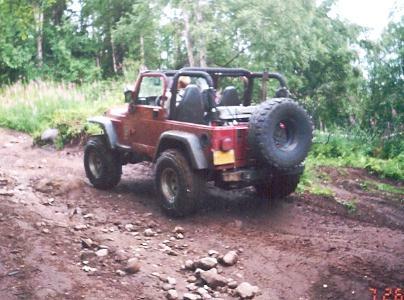 After winching up the 2ft bank, we hit the hill at full throttle and got up it. Now it is Cole�s turn. He kind of figured that there was no way his Jeep would be able to get up the bank if the three that just tried it couldn't. So Cole hit the far left side of the bank, and blasted right threw the thick nasty mud. And after running threw the mud, Cole blasted up the slick hill. When Cole got to the top of the hill, where we were setting cleaning off are windshields, Jeb, and Dave made there attempted to go to the very top of the mountain. Only a few dare to go up such a hill. 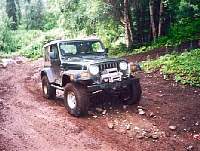 As we were about ready to head up, we heard the rumble of another vehicle heading up the trail. It was are old friend Roger. Roger was in his new built Geo tracker. And with it just being built, we dared him to go into the nasty mud pit. He made a valiant effort into the goo, but with just having the 4 cylinder under the hood, along with 33� tires, he just couldn�t do it. So we went back down the hill (which by then, the rain had set in) to help Roger out of the pit. At first the light little tracker was pulling right across the pit, until it fell into a deep rut. Which then started to pull are CJ to him. 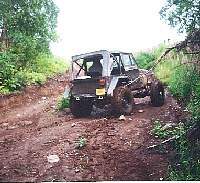 We didn�t want him to pull us off into the mud pit, so we un-hooked the cable, and I whipped the Jeep around to see if hooking to the back, and being in a rut would hold the CJ. But, again the tracker started pulling are CJ to him. So by then, we knew we had to get to the top of the hill, were we could be on flat surface, so he wouldn�t have a chance to pull us to him. We got in or Jeep, and hammered it up the slick, steep hill. Which now the rain had made even slicker. After we were able to get to the top, the tracker came right out with no problem at all. By then, Dave and Jeb were on there way down. They told us that they got to the face of the mountain, and tried to climb it, but to No-avel. Dave said that he got half way up it, came down it backwards, and then while coming down it backwards, spun around. Now that is what I call a rideJ I forgot to mention, that about 3 weeks ago, a guy in a full size bronco tried to climb the same hill. And came down it rolling 10 times. After some of the club members went up there, and helped it back on the trail, we were called to pull it out of the trail. Now we were all back in a group, and were headed down. But, we just had to hit the mud pit one more time, to get the better of it. And we did just that. Blasting all the way threw it. All in all, a fun trip. Not to much of a challenge, but just one of those trips that you have a lot of fun on. Maybe the next write-up will have some breakage in it.